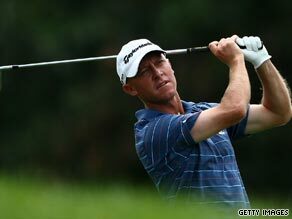 (CNN) -- Australian Nathan Green beat Retief Goosen in a playoff to win the rain-delayed Canadian Open to secure his first PGA Tour victory. Nathan Green beat Retief Goosen in a playoff to secure his first PGA Tour victory in the Canadian Open. A par on the second hole at at the Abbey Golf Club at Oakville proved decisive in the first Monday finish in the event since 1988. Green missed a 12-foot birdie attempt on the par-four 17th, before South African Goosen missed with an eight-foot attempt for par. Earlier, Green completed a third-round 69 with an eagle on the 18th hole and shot a 68 in the fourth round, while Goosen three-putted the 18th for par and a 67 in the morning, then eagled it in the afternoon for a 69. Goosen had a putt to win on the 18th -- the first extra hole -- but missed a six-foot putt for birdie after leaving his bunker shot above the hole. Green, who won the European Tour's New Zealand Open in 2006, told www.pgatour.com: "It's a huge surprise to finally win. This is where I started my professional career." Anthony Kim and overnight leader Jason Dufner were tied for third after one-over- par final rounds of 73, four strokes back on 14-under in an event marred by nearly five inches of rain the first four days. Lee Janzen finished with a 67 for a share of fifth, one shot further back, alongside Brandt Snedeker and Jerry Kelly.